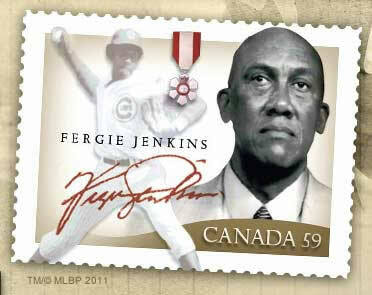 Canada Post issued the Fergie Jenkins/Black History commemorative stamp in February 2011. As you saw in this website’s History & Timeline section, the design went through a number of creative evolution to arrive at its final polished form. The image of Fergie in his Chicago Cubs uniform is taken from the cover of the August 30, 1971 Sport Illustrated. The profile picture of Fergie was taken by Fergie Jenkins Foundation Executive Director John Oddi. Canada Post went the necessary process of securing permission and reprint rights to both images. The new stamp comes in a booklet designed to look like a realistic baseball game ticket. It holds ten stamps. The stats and image on the booklet cover were supplied by the Foundation. The ticket concept was developed by Foundation President Carl Kovacs in concert with Rick McCorkell of Canada Post. The Official First Day Covers were designed for Canada Post by Lara Minja of Vancouver’s Lime and approved by the Fergie Jenkins Foundation. On the back of the envelopes you will find three reproductions of baseball cards from Fergie's career. These are reprinted with permission from Major League Baseball and The Topps Company Ltd. The prepaid postcards, also designed by Minja for Canada Post, were approved by the Fergie Jenkins Foundation. The postcard image of Fergie pitching also appears on his autobiography by Triumph Publications’ Fergie: My Life From the Cubs to Cooperstown, which was released in 2009. Fergie would like to thank Jim Phillips, Director of Stamp Services for Canada Post for his suggestion and encouragement regarding the creation of this website to commemorate this auspicious occasion.